Multiple factors may alter the shape of a cell survival curve. These factors usually cause a shift in steepness of the curve. 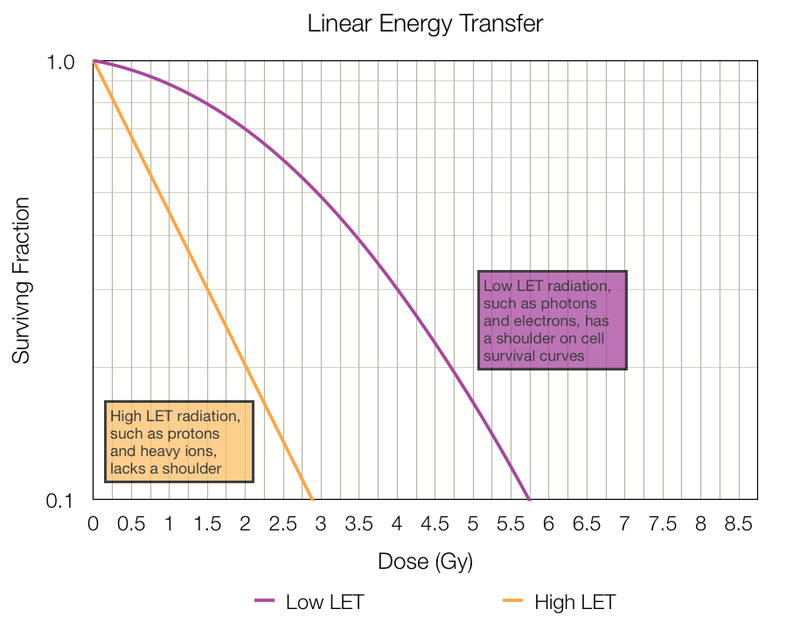 Low LET radiation (eg. photons, electrons) are highly dependent on the presence of oxygen to ‘fix’ damage caused by radicalised DNA. 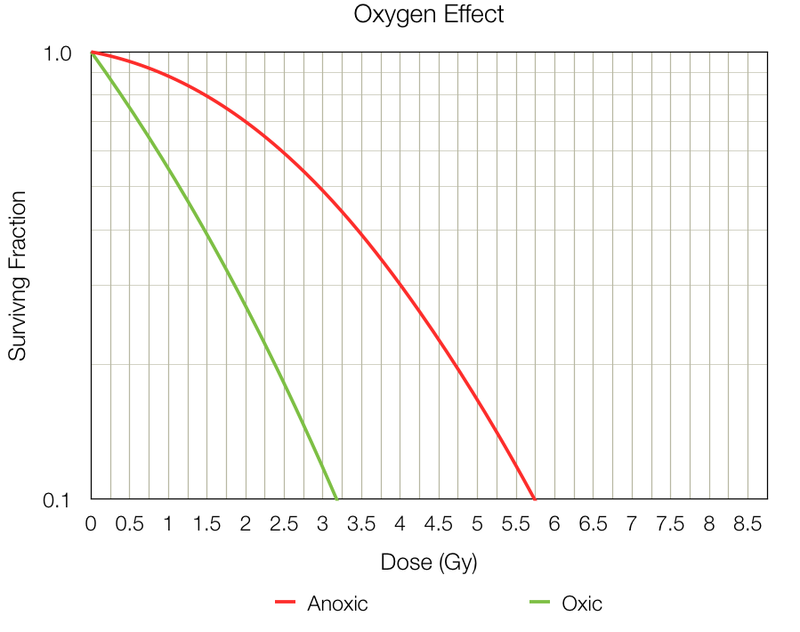 In many cell cultures the presence or absence of oxygen leads to the oxygen effect, with more cell killing in oxic conditions. This is seen in cell survival curves as a shift in the steepness of the curve. As low dose rates, DNA repair processes are able to repair damage during the radiation treatment. At very low dose rates other radiobiological effects (re-oxygenation, redistribution and repopulation) may also begin to play a role. This lessens the effect of a particular dose of radiation. Low dose rates tend to negate the β component of the linear quadratic equation, and the line becomes straighter on a logarithmic scale. The ideal LET for radiation (that leads to highest cell kill) is approximately 100 keV/μm. With this LET, the relative biological effectiveness may be 4 – 8 times higher than for megavoltage photon radiation. Radiation with particles in this range (alpha particles of about 4 – 5 MeV) leads to a very steep cell survival curve with minimal shoulder. As LET decreases, the curve develops a shoulder and is much less steep. As LET increases above 100 keV/μm, the cell survival curve begins to flatten as overkill occurs. Early responding tissues – such as epithelial stem cells and most tumours – have a high α/β ratio. Their cell survival curves usually follow a more linear path on a logarithmic scale. Late responding tissues are more sensitive to fractionation with a low α/β ratio. Their cell survival curves demonstrate a larger shoulder with greatly increased cell killing with higher dose. See the next topic for an example.